Singing classes which double as performing groups–what’s not to love? 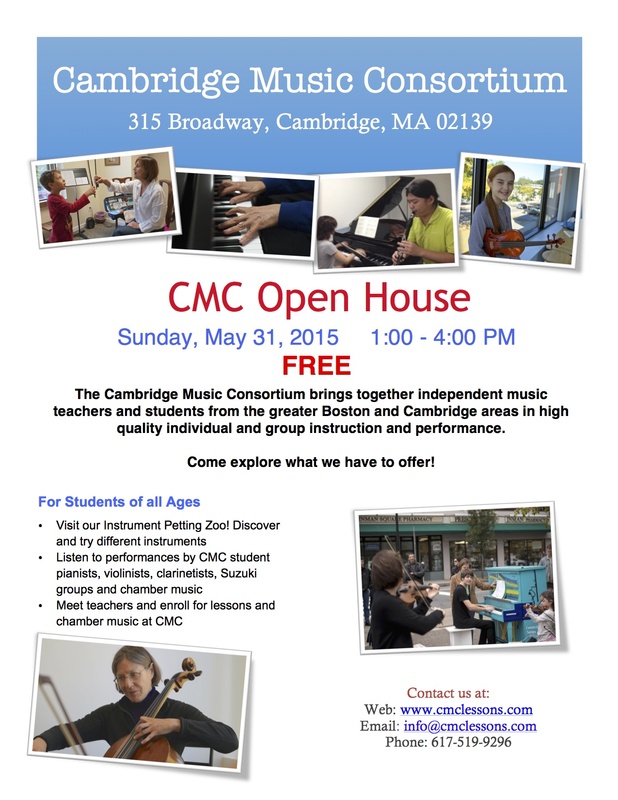 Two groups start this week, plus private lessons in Central Square and Jamaica Plain. A new semester begins! Study Handel at NEC’s School of Continuing Education on Wednesday evenings Handel for Singers and Instrumentalists begins January 20. 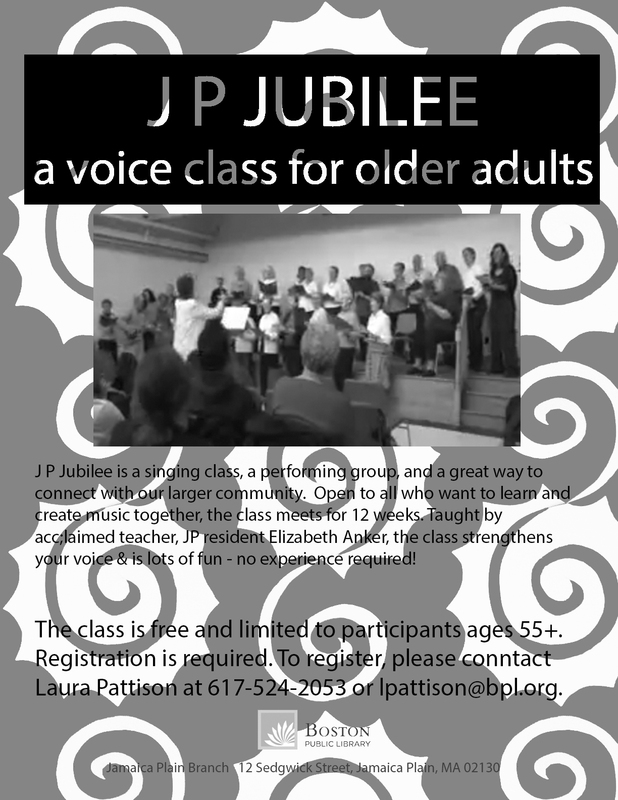 If you want to join the JP Jubilee singing group, the wait is until February 19, 2016. Contact me for further info about this group that meets on Friday mornings, and, like the Platinum Singers, is a class and a performing group. We meet at Curtis Hall in Jamaica Plain. BUT wait, there’s more! Private lessons with me, of course, in JP and Cambridge, AND our monthly Circle Singing group meets Sunday January 10 at St. Mary’s Church in Central Square, Cambridge. Please contact Peter McLoughlin if you’d like more info. Runs 4:30-6:30pm, fun group improvisational singing à la Bobby McFerrin. I was good in school, but bad at two things: penmanship and conduct. Got “Satisfactory” in both subjects–like a gentlewoman’s C.
Well, I’m not sure I behave any better as an adult, but I am learning to conduct better. Conduct others, that is. Turns out, it’s a neat trick to be able to telegraph musical ideas in new ways. I’m used to singing, breathing, moving to give signals to colleagues when I’m performing. I’m accustomed to guiding the student(s) with my piano playing. Now, I am actually working with a pianist (a very good one–Megan Henderson is a singer, player and conductor herself) who will follow my gestures and take my tempi, all with a wave of a hand. I had some great choral conductors in my life. Tom Fettke was my high school chorus teacher at Oakland High School. William F. Russell at Pomona College, Louis Magor in the San Francisco Symphony Chorus, Roger Nelson in the Port Costa Players, and Craig Smith at Emmanuel Music in Boston. All these folks LET US SING, they let us BE MUSICAL. You have no idea how many conductors try to control a group of singers and get no music made at all. Others try but are ineffective at keeping a beat or showing what they want. The leaders who inspire me clearly LOVE their players and the music. I once sat onstage to watch Bernard Haitink conduct the Concertgebouw Orchestra in Brahms 2nd Symphony (We called it the Tweedy symphony after that because of the Dutch spelling of 2nd: Tweede). He looked at his players with such warmth and respect, and wow, did he get a sound from them. This past weekend I heard and saw Maria Schneider and her Orchestra perform in Boston. This woman attracts the very best jazz players, folks who ordinarily wouldn’t be playing with such a big group–they are all marvelous soloists on their own. And she not only writes such beautiful arrangements, but she clearly lets them do their musical thing. Not just on their solos, but being musical partners to her tunes all through. So as I begin my new phase of conducting these voice classes of elder adults–away from the piano, just standing and waving and breathing–I am inspired by the marvelous models above. And others. So far, so good. We sang a dress rehearsal at a senior residence this morning, and I really enjoyed just being with the music and with my group. Listening, loving, not worrying about how I was doing, being in the moment. JP Jubilee in concert tomorrow night, Jamaica Plain branch library, 7:00, free. Very short program. Platinum singers begin their summer session May 7 at the Harriet Tubman House. 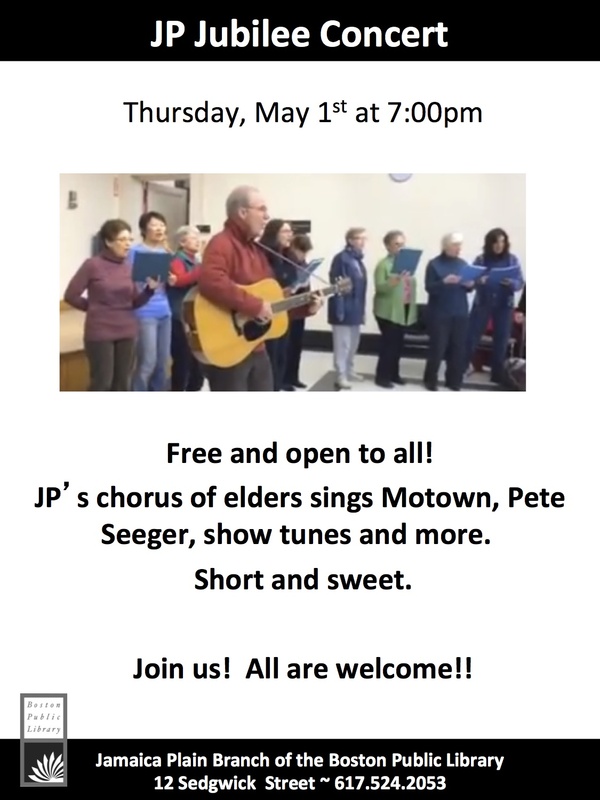 The chorus at the Simon Fireman Home in Randolph is making a couple of field trips in June (one to visit the Platinum Singers, their “cousins” through me, and the other to the “Mother Ship” of Hebrew Senior Life in Roslindale.) We’re working on “Goin’ to Boston” and other tunes about Time and Place. 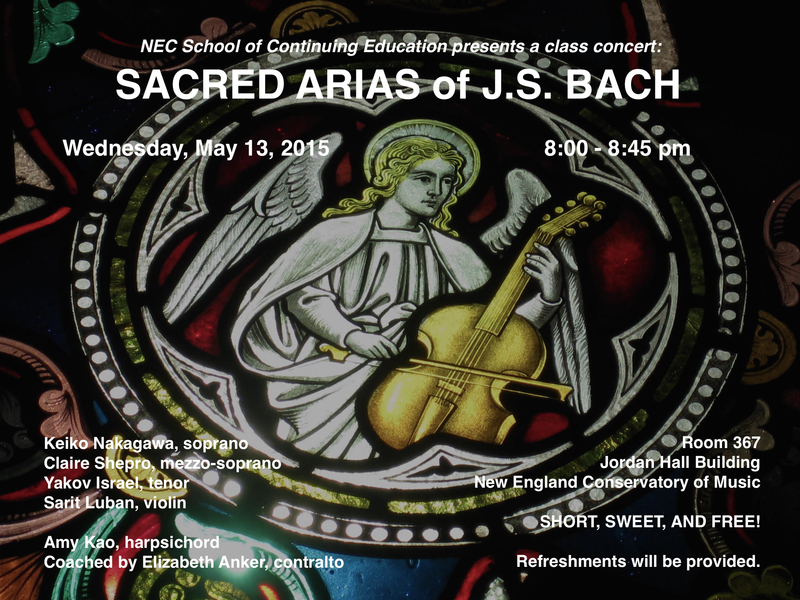 Sing the fabulous arias and duets of Bach with instrumentalists. Develop style, phrasing, and rehearsal techniques; Perform at end. Prerequisite: Familiarity with singing German and ability to learn music on one’s own. Seniors have a blast singing, learning vocal health, and performing!